What's different on 10 GHz EME ? The differences on 10 GHz EME, compared with the well known conditions using 2m or 70 EME are pointed out in this essay. There are the effects of the small beamwidth and the change in characteristic of reflection at the moon. Also, the moon noise causes a reduction of sensitivity in the receiver. Usually, the path loss is calculated using the RADAR equation. The effective cross section a of a target is defined in the unit of an area. If the surface of the sphere is only poor or non conducting, e.g. the moon, the cross section has to be multiplied with a corresponding reflection coefficient. If the target isn't a sphere, equivalent values for s have to be measured or calculated. Calculating the path loss instead of the received power, the values P(t) and the antenna gains G(t) and G(r) have, to be fixed to the factor 1, equal to 0 dB. With the moon, considering an average in distance, the path loss on 10 GHz can be calculated as 289 dB. a) The beam of the transmitter/receiver antenna has to cover the target several times. b) It is not allowed, that the target is formed by combining spreaded single reflectors. On 10 GHz EME, both restricting conditions are partly broken. Observed from earth, the moon covers an average cross section of 0.5º width. - in perigee with a distance of 356,400 km Þ 33'32"
- in apogee with a distance of 406,700 km Þ 29'14"
On 10 GHz a dish of 1mtr has a 3 dB angle of 2º. Therefore, a 2 mtr dish has a 3 dB angle of 1º and a 4 mtr dish only 0.5º. Larger dishes cover only a section of the moon. On lower frequencies, e.g. 2 m, usually 50% of the backscattered signal is reflected from a small central area on the moon. RADAR echoes on 400 MHz already show, that not only the center, but also the other areas up to the rim cause a part of the reflection. Therefore, on 10 GHz the whole visible area are more or less producing reflections. Approximately, the moon surface is a combination of a huge, number of single reflectors. So, the echo is scattered and contains parts with different travel times. The basic doppler on 10 GHz can be more than 20 kHz. As the doppler can be calculated in advance by different programs, this shouldn't be a problem. The dopplersmear is a SHF/EHF specific problem on EME. Containing spectral parts from both sides of the center frequency, the CW-signal in the RX isn't a clear single tone. It sounds a little bit similar to rain-scatter signals, although the rain-scatter signals might be from a rougher type. But there shouldn't be a problem for a well trained CW-operator to copy this melodious signals. Using signal processing care has to be taken about the covered bandwidth. 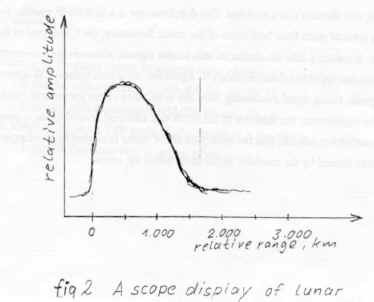 As a reason for the signalsmear, the libration of the moon was assumed several times in previous applications. 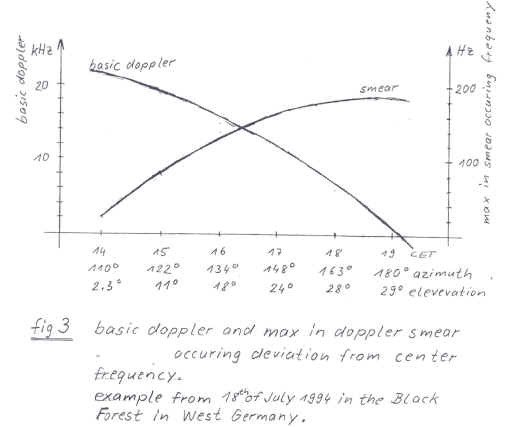 The authors opinion is, that the main part of the smear is caused by the doppler of different moon areas formed by the rotations of the earth below the moon. Examples: Conditions: - The test stations are in the northern hemisphere. - a) the moon is for the test station in culmination. There is no variation in distance to the center and the northern and southern parts of the moon Þ no basic doppler occurs. Caused by the rotation of the earth, the test station travels to the left rim of the moon and simultaneously away from the right rim. So, the left side produces a positive doppler and the right side produces a negative doppler with identical value. The maximum frequency shift will be approx. ± 180 Hz. The spectral distribution isn't exactly known to the author. With wider antenna beams, it is supposed to be a cos² function. - b) The station works at moonrise or moonset. Here, the normal doppler has it's maximum and the relative variations in distance to the lateral rims are in a minimum. Therefore, also the dopplersmear has its minimum. Fig. Nr.3 shows the relations between doppler and pass of the maximum frequency shift by the dopplersmear. - c) QSO between stations in North America and Europe, both located around the same latitude. Many variations of dopplersmear are possible. If the moon has the same elevation for both stations, the smear is at minimum. The test station illuminates only parts of the moon. As the antenna doesn't illuminate zones with a big relative motion, there is only a little dopplersmear, also when the moon is in culmination. 0H6DD has already seen this effect (see DUBUS 2/94). He worked with a very big dish during previous tests and found out, that almost no dopplersmear occurred. Often it is assumed that the atmosphere causes a considerable additional attenuation, especially with fog or rain. This might be allright when you work with very small elevations of the antenna, or during a heavy thunderstorm. But during tests with elevations of more than 15° also heavy rainfalls didn't cause any disturbance. As it was raining during most of the EME-QS0s of the author, he was able to get much experience. The reason for this effect is, that the bad weather zones, the signal has to pass through, are hardly 1 km in distance when the station works with a sufficient elevation. 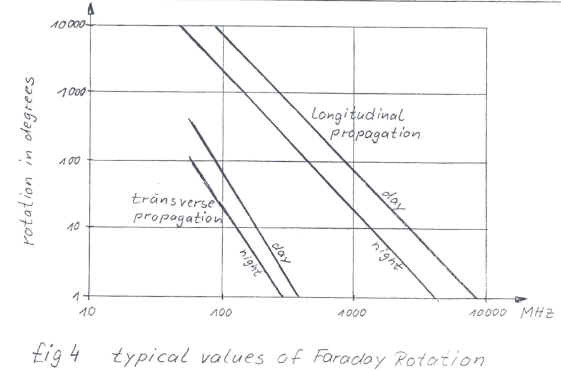 Fig.4 shows typical values of the Faraday-Rotation. This figure says, that there is no considerable Faraday-Rotation on 10 GHz. It is therefore not necessary to work with circular polarisation. Using linear polarisation, you have to take care about the basic rotation for reflections at the moon. The American recommendation, used by most of the active stations, seems to be a usable compromise. Considering this, the rotation among American stations is kept low, among the European stations it is even lower. Between America and Europe there are always approx. 90°. Currently, 10GHz EME stations only exist in America and Europe, so you can contact every partner in a session without any modifications. As with all EME systems, the antenna should be set to an optimum compromise between gain and the reduction the received earth noise. Several tests have shown, that for antennas with a f/d from 0.27 to 0.4 a VE4MA horn is useful. Fig.5 shows the modifications made by the author. An experiment is the best way to find out the optimum for feed-position and position of the corrugation. a) Put corrugation in the expected position, and fix horn and corrugation near the expected focus. c) Alter the position of the horn in steps of 5nun and find out the optimum. 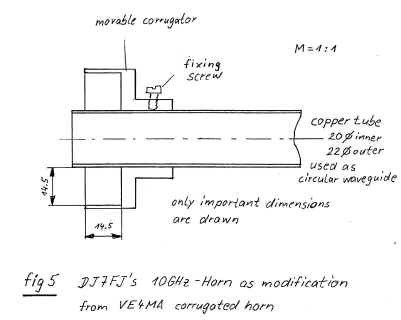 d) Fix the horn in the optimum position and alter the position of the corrugation in steps of 2mm. c) Check the optimum for the feed position when the corrugation is fixed to best position. Repeat all again if necessary. f) Check the moon-noise after the optimisation with the sun. g) If necessary correct the positions carefully. This will take a lot of time, but it's worth. The earth-noise should be minimised by optimising the antenna. Nevertheless, this part of the ant -noise will always be 20 to 40K. The galactic background noise could be ignored, because it's lower than 1O K.
On 10 GHz, the moon-noise, causes the most important effect for the sensitivity of the system. It can be seen as a noise source with a temperature of approx. 21O K. On one hand this is a positive effect, as you can use the moon-noise for the tracking of the antenna. On the other hand, it limits the sensitivity, especially with larger antennas and therefore the noise factor of the pre-amp gets less important. As today noise factors of lower than 1 dB are common, the preamp shouldn't cause any problems. The loss of the RX-feed can be minimised by using waveguide relays and placing the preamp at the feed. Using programs, e.g. from VK3UM, it is possible to calculate the azimuth and elevation angle or the declination and rectaszension with a sufficient accuracy. Nevertheless, it is recommended to control the alignment of the antenna once in a minute with the moon-noise. Therefore, a broadband noise-RX in a parallel receiver section can be used. Charlie G3WDG has developed such an RX. In order to have a closer look at the reflections on the moon, it is necessary to analyse the power density in the antenna beam. The antenna used in the following tests is a parabolic dish with a standard pattern characteristic. The first side lobe is 20 dB down and the second approx. 26 dB. All the other side lobes are ignored. There is no difference between E- and H-plane in the radiation pattern. A numerical method is used to get the power density of the antenna. So it is possible to avoid complicated mathematic methodes. Fig.6 shows the radiation pattern and the equivalent distribution of power density. - The x-axis is the rotation angle. - Only one half of the pattern is displayed. - The factor I on the x-axis marks the 3 dB point or the half 3dB angle. 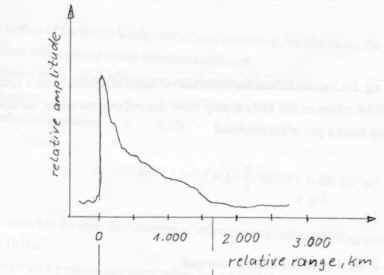 - The left y-axis shows values of relative power level of the radiation pattern. How much power is in the antenna beam from the maximum to all 3 dB points? Answer: Approx. 55% of the transmitted power. How much power is in the antenna beam up to the double of the 3 dB angle? Answer: Approx. 90% of the transmitted power. The result for the reception of moon noise shows Fig.7. The non-linear gradient in this graph is caused by the radiation pattern of the antenna. 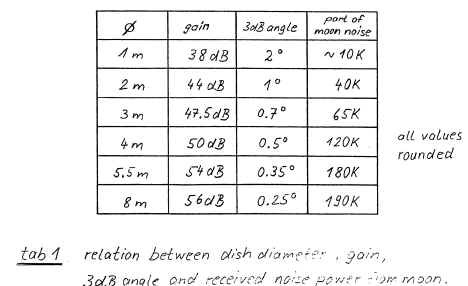 How much moon noise is received using a 4m dish? How much noise is received with a 1 m dish? A result of this investigation shows, that the noise temperature (noise figure) of the RX is not critical, working with a large dish. In this chapter is only taken care about the absolute received power. The signal/noise ratio will be considered in the following chapters. Fig. 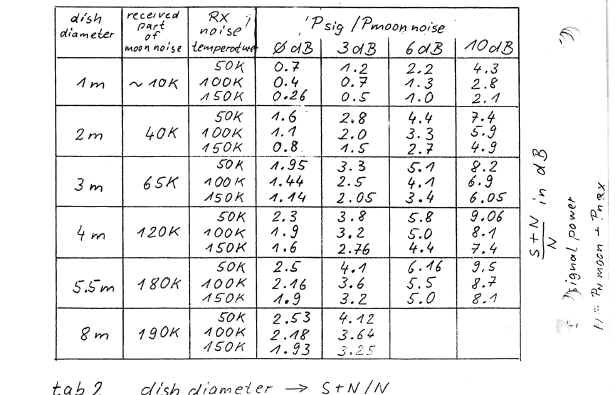 8 shows the connection between antenna size and received power level, assuming a constant transmitted power. For transmitting and receiving, the same antenna is used and a dish with 4m in diameter is taken as a reference. The diagram shows that with antenna diameters smaller than 2 mtr the RX-signal behaves as commonly assumed. At diameters from 2 to 4 mtr appears an additional loss of 1.5 dB. The cause for this is the power density in the radiation pattern as the 3 dB points now approach the moon's rim. With diameters from 4 to 5.5 mtr the signal increases again like it does with smaller antennas, but a basic loss of 1.5 dB has to be added. 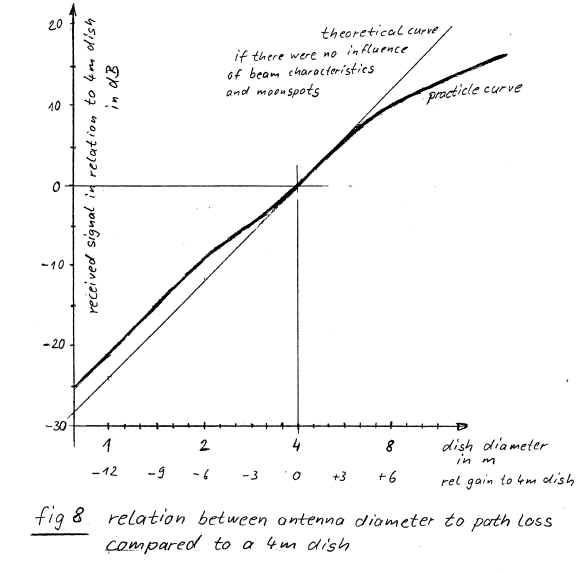 At larger diameters, the curve bends, and by using dishes of more d= 8 mtr, the receiving level increases not with the double antenna gain. It increases only with the single amount. Using small dishes (relative wide antenna beams), only a small part of the beam illuminates the moon. Considering Fig. 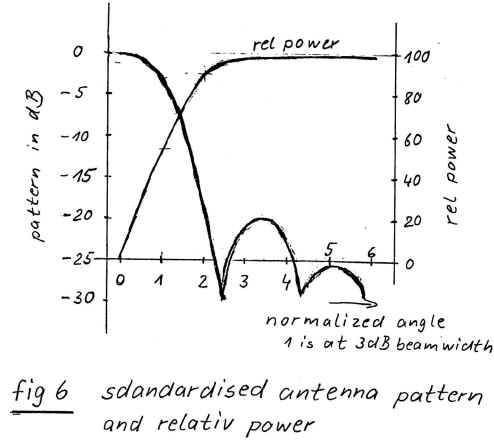 8, there is an almost linear relation between beam width and power level with antenna sizes. Is the antenna beam approx. 0.5°, the moon therefore fully covered, the power density on the moon is direct related to the radiation pattern of the antenna. With large dishes (narrow beam widths), the beam illuminates only a spot at the moon. So, almost all transmitted power reaches the moon (as with LASER), only reduced by the loss in the atmosphere. The power reflected by the moon can not be increased by more antenna gain. The losses of reflection are assumed to be the same, whether the diameter of the spot is 1000km or 100km. The reflections on the moon surface are diffuse. When the same antenna is used for transmitting and receiving always the same moon spot is illuminated or observed. Using bigger dishes, the received power increases only with the single gain factor. Now, more gain can only be made on the receiving side. The moon always reflects the same sum of energy. If the surface of the receiving antenna increases, this will have an effect on the power level. What happens with the received power when stations use different antennas? With antennas up to 6m in diameter everything is O.K. If only one partner uses a bigger antenna (>6 mtr), nobody gets a higher RX-signal level. Only the Doppler smear decreases. The OM with the relative small antenna illuminates the moon almost completely. The OM with the big antenna only observes a spot at the moon. If he now increases the antenna, his receiver level stays almost the same because the observed spot becomes smaller. The reduction in the spot size is compensated by the bigger antenna size. This effect is reciprocal. It's also valid when the OM with the big antenna is transmitting. He only illuminates a spot at the moon; therefore the OM with the small antenna receives the same power level, independent from the spot size. To simplify the calculation of the path loss in such combinations, the gain of the big antenna can be fixed to the gain of a 6 mtr dish. If both partners use big antennas, the station with the smaller antenna produces the limiting factor. To calculate the path loss, both antennas have to he set to the same size, equal to the dimensions of the small antenna. The effects of big dishes from institutes, e.g. VE3ONT at Algonquin Park, on 'normal' partners are the same as with dishes of only 6m in diameter. On 10 GHz EME the received noise temperature of the moon has to be added to the system temperature. Using 10 GHz, the moon has a noise temperature of approx. 210 K, The received amount of moon noise depends on the size of the antenna, only very big antennas (diameter > 6mtr) receive the full noise power. The smaller the antenna, the smaller the amount of noise power that is received. 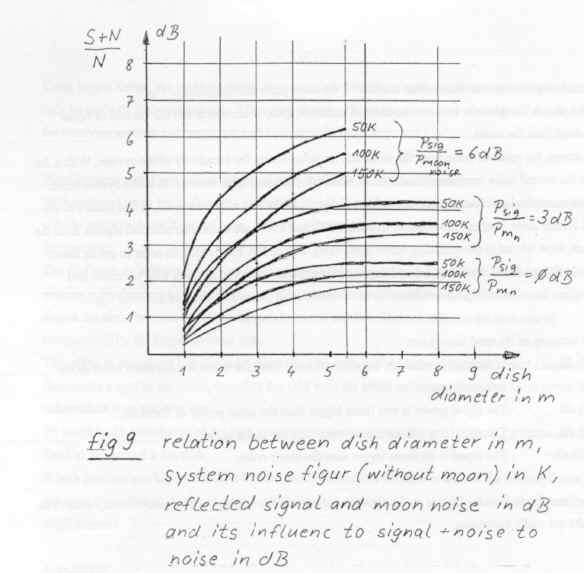 Considering the antenna beams from chapter 12 the noise parts can be found in Fig.7. Tab. 1 shows the relations between the antenna diameter, gain, beam width and the amount of noise received from the moon. Of course, the received noise from the moon has an influence on the sensitivity of the system. With a 2 mtr dish the overall noise temperature rises about 40K and a 4 mtr dish adds even 120K to the system noise. Some examples have been worked out to have a closer look at this effect. Therefore, dishes from 1 to 8 mtr and system noise (without moon noise) of 50K, 100 K and 150 K are used. 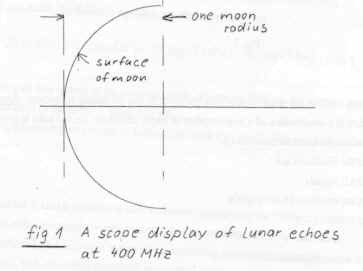 The reflected signals from the moon were related to the according moon noise using a fixed RX-bandwidth. In order to get an easier look at the relations, it will be assumed that the partners antenna beam is wider than the moon and therefore the reflected signals are from the same distribution (room and area) as the noise signal. 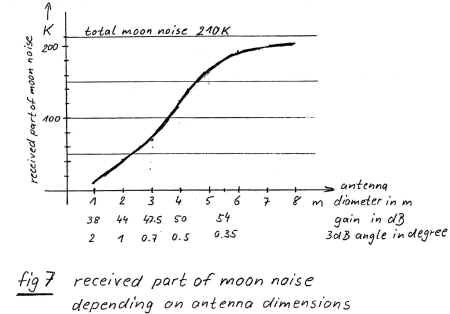 0 dB - In the used bandwidth, the received noise from the moon has the same value as the reflected power. 3 dB - The signal power is two times bigger than the noise power of the moon. 6 dB - The signal has 4 times more power than the moon noise. 10 dB - The signal is 10 times bigger than the moon noise. Tab 2 and Fig 9 show the effects on the signal/noise ratio in the correct form (signal + noise)/noise. The results are really interesting. It can be seen at once, that already an antenna diameter of 4 mtr is the limit. Bigger antennas don't produce a better signal/noise ratio. On the other hand, the receiving loss using a 2 mtr dish is relative small. Increasing the power is the only effect, that directly effects the received power of the partner. Antennas bigger than 3 mtr hardly improve the own receiving quality, but they produce, as long as they are smaller than 8 mtr, a bigger RX-signal for the partner. Antennas smaller than 3 mtr can be useful as receiving, as long as a very good preamp is used. But the power should be increased to produce sufficient receiving power at the partner. Improving the System noise to values lower than 1 dB only produces a positive effect, when small dishes are used. Antennas bigger than 6 mtr in diameter are not very useful. The partner with the small antenna receives a signal like transmitted with a 6 mtr dish. The OM with the big antenna doesn't receive a stronger signal as by using a 6 mtr dish. Only the doppler smear decreases. An improvement in signal/noise ratio is only made when both partners use dishes with more than 6 mtr, under the condition, that both illuminate the same spot at the moon. RX NF: The program adds 50K automatically. So, 50K have to be subtracted from the system noise figure that is formed. by the antenna noise (without moon) and the noise of the preamp. Then, the equivalent noise figure of the moon (see chapter 14) has to be added. This noise temperature has to be transformed in the equivalent noise figure and then insert in dB. RX BW: The effective bandwidth of the ear/brain combination of a well-trained CW-operator corresponds with approx. 100 Hz. This is relative unaffected by the real used receiver bandwidth. Therefore you can set this value to 1OOHZ. ANT gain: For gains lower than 51 or 52 dB just insert the real value of the antenna gain. With gains of more than 52 dB, you have to consider the gain of your partners antenna. - If your partner has less than 52 dB, the own gain should be limited to 52 dB. - If your partners antenna has equal or more than 52 dB, both stations have to use the same value. Therefore, the antenna gain should be set to the gain of the smaller antenna. This essay shows some differences you have to deal when moon bouncing on 10 GHz. The conditions on other SHF-bands are similar. Some of the physical approaches are not in the highest scientific exactitude. But the author is convinced that they are of sufficient accuracy for practical use. Some QS0s and noise measurements with the moon prove this. The author thanks his QSO partners (actually 9) for the tests and the informative discussions with Charlie G3WDG, Goliardo 14BER and Jim WA7CJO. Also for the support by his partner Gregor DL2GSG and some non-licenced fellow workers, who are developing RADAR devices for industrial level measurement at the QRL. Some problems of these short-distance RADAR devices are correlated with those on 10 GHz EME. For example, the target is wider than the antenna beam most of the time and the reflections of solids, e.g. dry sand, can be compared with that from the moon surface.